Unless you have a ton of work to catch up on or just really, really want to sample every item on that Chili's To-Go menu, getting stranded at the airport for hours after missing a flight feels like a cruel punishment. 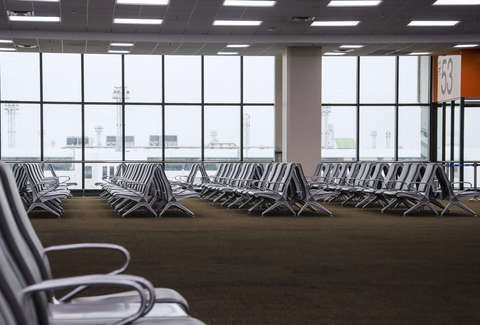 Some hearty travelers, though, choose to pass the time in more creative ways, like one woman in Atlanta who recently decided to take advantage of a mostly empty airport during a long delay to film a music video, starring herself. Earlier this week law student Katie Gould missed her flight out of Atlanta and ended up stuck waiting for the next one for four hours, during which she got inspired to make light of the situation with some Hall & Oates and an impromptu solo dance party. She filmed herself dancing around in different parts of the airport, and edited it together to the song "You Make My Dreams" to create one hell of a guerrilla music video. She posted the final cut to Twitter (posted below), and as of this writing it's already been liked nearly 75,000 times. In the video, Gould turns everything from gate waiting areas, an information booth, escalator, and airport tram into a makeshift dance floor. In some scenes she even gets her cat Bowie in on the action, cradling him as she busts a move. You also briefly see her convince what appears to be an airport employee to dance a bit, too. All in all, it's a delightful piece of art well worth a watch, if only to serve as a reminder that there's light to be found in even the bleakest moments of travel despair.